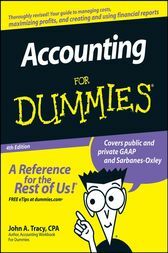 Financial Accounting ACG2021 SFCC Spring 2008 Chapter 2. In this chapter, Professor Susan Crosson discusses Accounting Transactions, and in particular: Account Anatomy. Part 10 of 10. Financial Accounting ACG2021 SFCC Spring 2008 Chapter 2. In this chapter, Professor Susan Crosson discusses Accounting Transactions, and in particular: Accounting Cycle. Part 2 of 10. Financial Accounting ACG2021 SFCC Spring 2008 Chapter 2. In this chapter, Professor Susan Crosson discusses Accounting Transactions, and in particular: Liabilities Dr & Cr. Part 4 of 10. Financial Accounting ACG2021 SFCC Spring 2008 Chapter 2. In this chapter, Professor Susan Crosson discusses Accounting Transactions, and in particular: Revenue Dr & Cr. Part 5 of 10. Financial Accounting ACG2021 SFCC Spring 2008 Chapter 2. In this chapter, Professor Susan Crosson discusses Accounting Transactions, and in particular: Expenses Dr & Cr Part 6 of 10. Financial Accounting ACG2021 SFCC Spring 2008 Chapter 2. In this chapter, Professor Susan Crosson discusses Accounting Transactions, and in particular: Journal Entries, subpart 1 of 2. Part 7 of 10. Financial Accounting ACG2021 SFCC Spring 2008 Chapter 2. In this chapter, Professor Susan Crosson discusses Accounting Transactions, and in particular: Journal Entries, subpart 2 of 2. Part 8 of 10. Financial Accounting ACG2021 SFCC Spring 2008 Chapter 2. In this chapter, Professor Susan Crosson discusses Accounting Transactions, and in particular: Asset Anatomy. Part 9 of 10.